Pump spray cleaner for use on whiteboards. Suitable for use on interactive whiteboards. Powerful cleaning action to remove ink and give boards back their whiteness. Use with AF Safecloths or Safetiss. 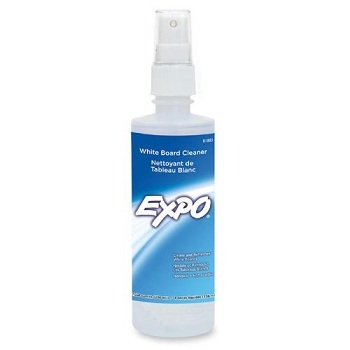 Convenient pump spray for everday cleaning of whiteboards. Quartet whiteboard cleaners are formulated to remove ghosting and ink residue. Regular care, maintenance and cleaning of your whiteboard will extend its life. Spray nozzle for clean application. 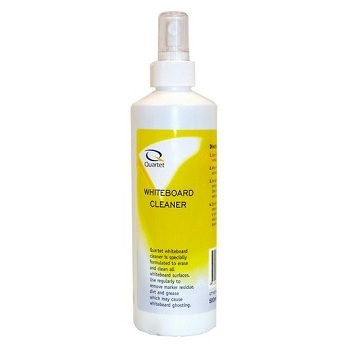 Non-toxic whiteboard cleaner is perfect for classrooms and conference rooms. 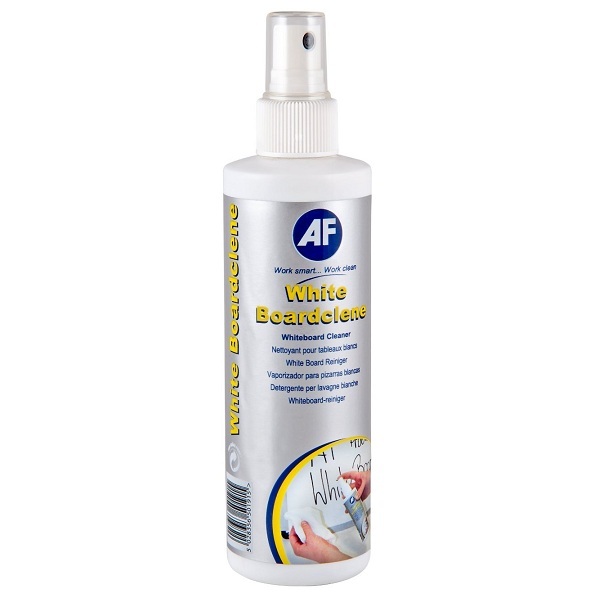 Cleans shadows, ghosting and stubborn stains from most white board surfaces. Gentle enough not to harm the board. Just squirt some in each area of the board and wipe with a soft cloth. Pump spray bottle for maximum board coverage. 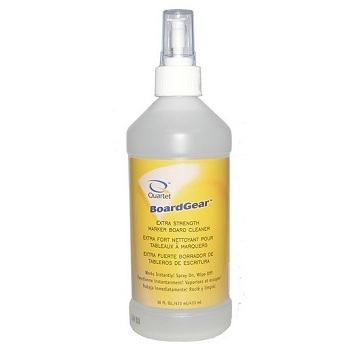 Premium BoardGear™ extra strength whiteboard cleaner. Cleaner works instantly to protect and remove residue and dirt for a clean and a clear white board surface. Just when you thought your whiteboard was beyond repair. 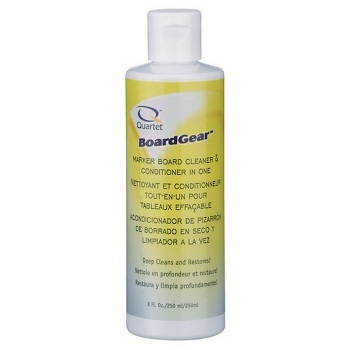 Conditioner/Cleaner cleans, conditions and restores white board surfaces for optimal performance. 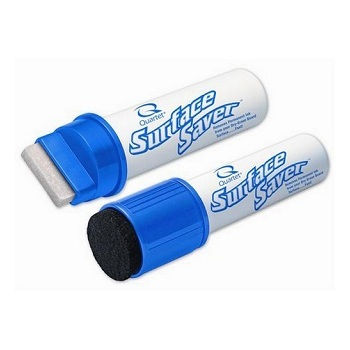 Removes any marks, permanent markers and stains off whiteboards. Ideally use once every 3 months to revive whiteboards, depending on usage. 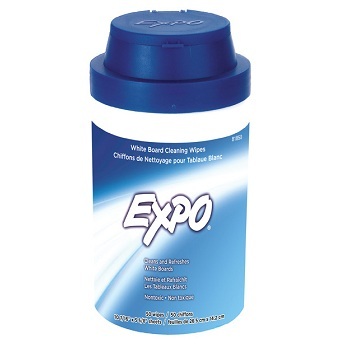 Each towelette is moistened with Expo cleaner. Unique storage compartment for partially used towelettes. Pack contains 50 re-useable towelettes. Erase permanent ink stains from white board surfaces using specially formulated cleaner and convenient in-cap eraser. Remove stains quickly and easily with over-sized cleaning surface. Simply open cap to dispense unique cleaning solution and wipe stains away for good with in-cap eraser.